My niece, Kristen, has autism. 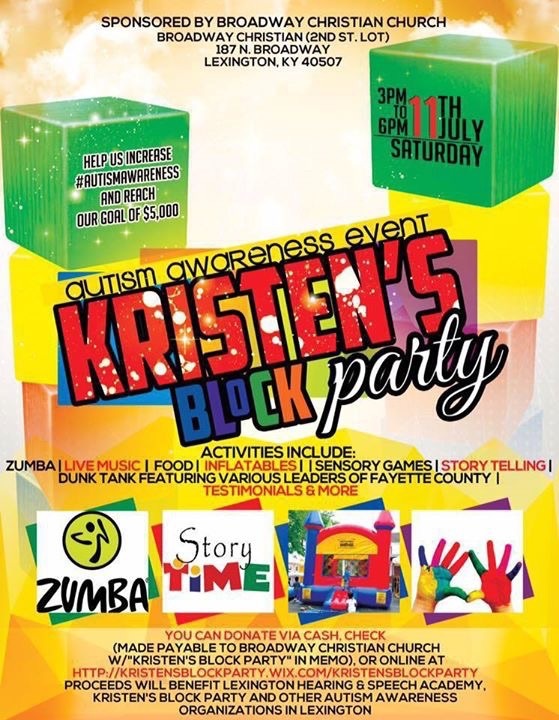 On Saturday July 11, 2015, Kristen’s parents, Lamont and Krissalyn Love, will host a block party to raise awareness and funds for less fortunate people who have children diagnosed with autism. Proceeds will go to the Lexington Hearing and Speech School in Lexington, Kentucky (their hometown). Autism spectrum disorder (ASD), or autism, is a group of complex disorders of brain development characterized by difficulties in social interaction, verbal and nonverbal communication and repetitive behaviors (Autism Speaks Inc.). 1 in 68 children (1 in 42 boys and 1 in 189 girls) have autism. Studies have shown that parents of children with autism notice a developmental problem before their child’s first birthday. Concerns about vision and hearing were more often reported in the first year, and differences in social, communication, and fine motor skills were evident from 6 months of age. It is estimated to cost at least $17,000 more per year to care for a child with autism compared to a child without autism. Costs include health care, education, ASD-related therapy, family-coordinated services, and caregiver time. For a child with more severe ASD, costs per year increase to over $21,000. Taken together, it is estimated that total societal costs of caring for children with ASD were over $9 billion in 2011. Please read the Love family’s story and donate here to help them achieve their goal of raising $5,000. Their Story: We noticed Kristen was not speaking like children her age, so we quickly got First Steps to try and intervene. Unfortunately, progress was not made in the way that we had hoped. 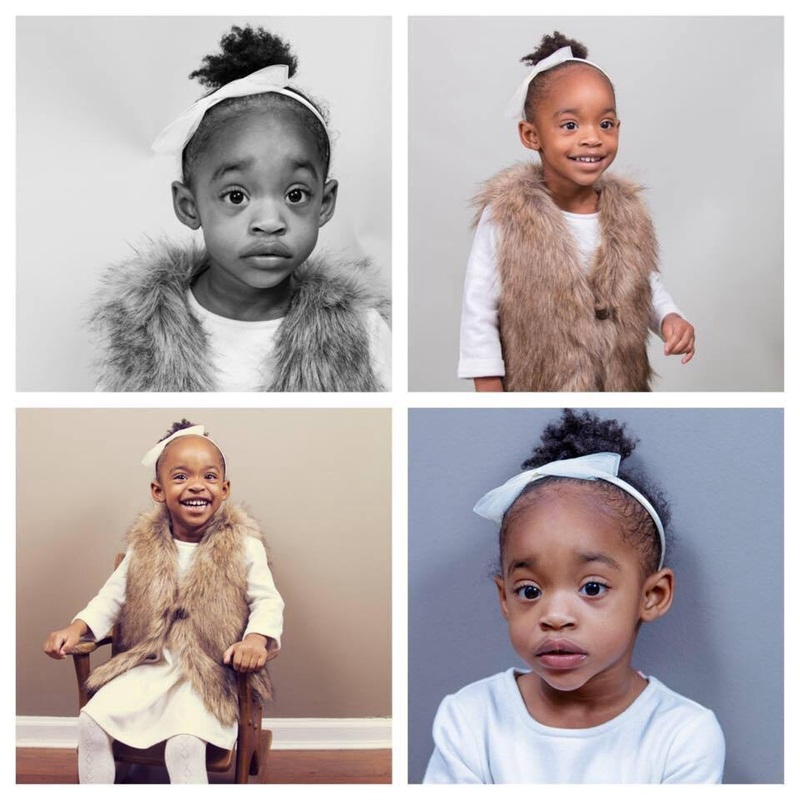 Right around time for Kristen to turn three, we got assessments after assessments done to see why Kristen was not hitting her developmental milestones. We learned shortly thereafter that Kristen had autism. We were devastated, as we didn’t know much about autism and we feared that she may not grow up to be a “functional” member of society. Fast forward a few months later, with prayer and patience, we have learned that autism isn’t a death sentence, but it is a help to hope sentence. We are hopeful with great intervention that our little Kristen will flourish to be the beautiful, smart, socially functional little girl that we foresee. What we have also learned, is that along with patience, constant desires to learn more and more about autism, that there is a large expense attached to having a child with special needs. Our goal is to begin an annual tradition that grows to be a revenue builder for grants, scholarships, and research. Vision: What do you think of when you think of a block party? We automatically think of a neighborhood party with family and friends, full of laughter, music, fun, food, and games. That’s our vision for the block party. Here is the twist though: with children who have autism, they often have a certain toy or kind of toy that brings them joy. In our experience with Kristen, she absolutely loves anything to do with blocks: building blocks, Legos, building shapes, etc. So on one hand, it will be your typical block party; but on the other: expect to be blown away! This is a family event where we invite people indirectly and directly affected with autism or any special needs child to come and enjoy a night out. Our hope is to educate those who may not know much about autism to learn what it is like having autistism, as well as to learn what it is like to love someone with autism. There will be building blocks everywhere, mostly made of cardboard boxes. There will also be “blocks” of times for scheduled events. The idea is to do things that would be appealing to children with autism to teach people how some children with autism respond. Some examples of blocks of time include (but are not limited to) music, art, get educated, testimonial, movement, inflatable, and movie. Kristen’s Block Party will be on Saturday July 11, 2015 from 3 pm to 6 pm at Broadway Christian Church in Lexington, KY (187 N. Broadway). Please share this blog to spread the word! All are welcome to attend. And don’t forget, you can donate here.